Is there any manner in cutting fingernails? I heard in a lecture that in cutting fingernails, we need to start in the index finger of the right hand followed by the rest of the fingers. Is there any Daleel on this? The little finger of the right hand, the middle finger, thumb, ring finger and finally the index finger. Then, one clips nails of one's left as follows: The thumb of the left hand, it middle finger, the little finger, the index finger and finally the ring finger. 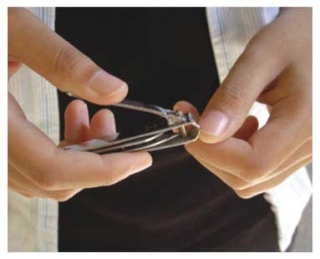 According to al-Shafi'e school, clipping one's nails has to be started with one's index finger of the right hand, since it is more honorable due to being used to attest Shahadah of Tawhid, then the middle finger, the little finger, the ring finger and finally the thumb. Then, the little finger of left hind, the ring finger, the middle finger, the index finger and finally the thumb. After that, one is advised to clip one's little toe of his/her right foot, and then, in turn one by one to be ended with the little toe of the left foot (Quoted freely from Mughni al-Muhtaj). However, we believe that the above-mentioned narration concerning the order of clipping one's nails has no foundation Ibn Daqiq al-'Id, a well known a verifier and Muslim scholar, said: 'Clipping nails in accordance with a fixed order has no foundation in Sharia'. He added: 'It is not allowed to believe in the approbation of clipping nails according to the above-mentioned order, since such a desirability has no evidence in Sharia. So, it is wrong to believe this easily'.